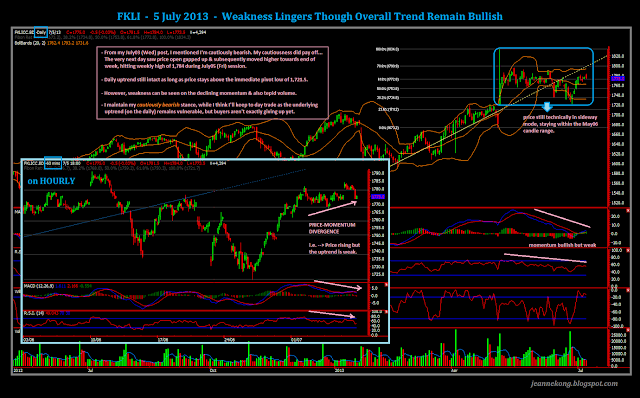 FKLI was flattish, slightly to the upside throughout the week, traded in lackluster volume within tight price range. 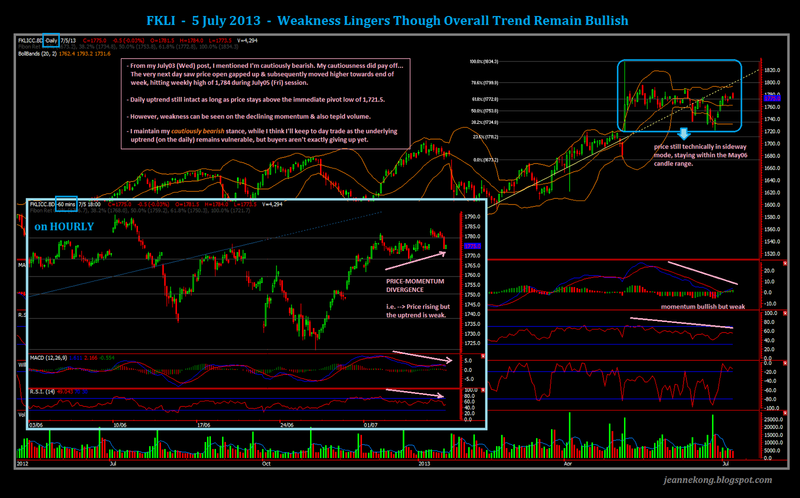 My cautiously bearish stance pays off as the sentiment turned a little more bullish since my last post on July03. Nevertheless, the uptrend on the daily, although remained intact (higher lows observed), suppressed bullish momentum suggests underlying weakness while price stuck at high. I'll be keeping my trades brief, avoiding holding positions, until the overall near-term direction become clearer. 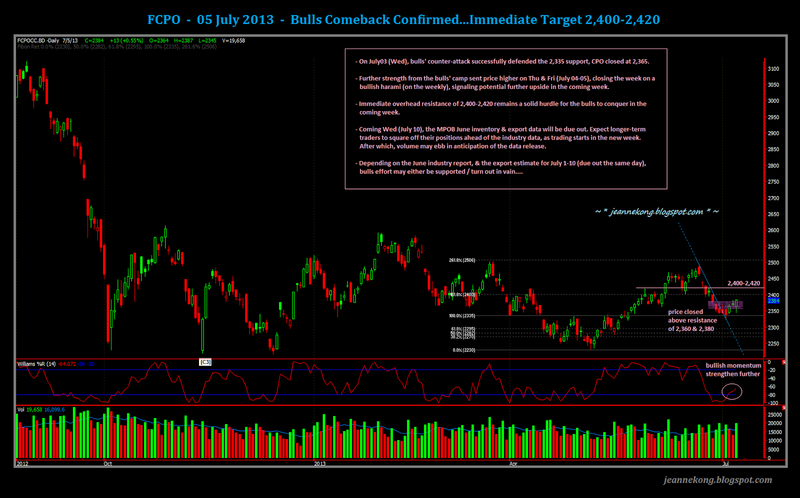 CPO bounce further in a corrective rally, after the bulls gained a upper hand in price control on July 03 (Wed). 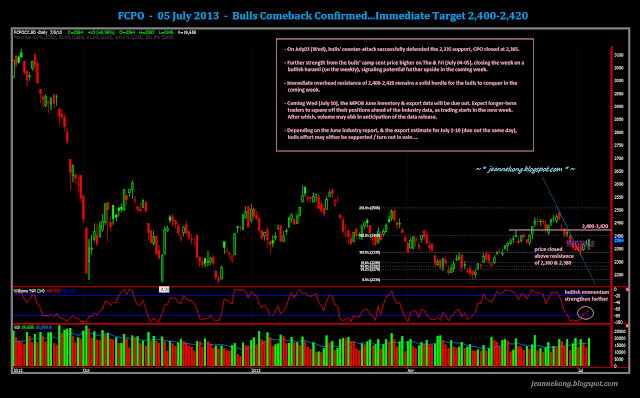 Target of 2,400-2,420 remains an overhead strong hurdle to overcome. Watch the MPOB June'13 industry report due out on July10 (Wed), as traders might square off their positions on Mon-Tue while Wed morning session may be quiet. GOLD bulls defended the 1,200 strong psychological support despite a very bullish NFP data out of Friday night, which sent Dow closing up nearly 150pts, shooting past its 15,000 strong resistance. Hitting an intraday low of 1,207 on Friday, gold price made a higher low (relative to the major pivot low of 1,180 formed 2weeks ago). Shall the 1,200 support level continues to hold, expect the corrective rally from 1,180 to extend further over 1,267 latest high. 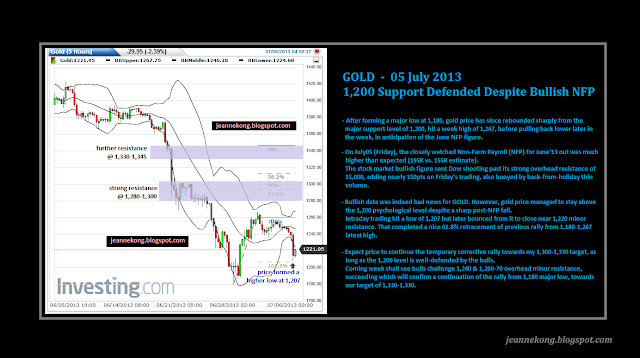 Immediate target 1,300 resistance.